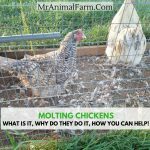 Molting Chickens – What is it, Why do they do it, How you can help! 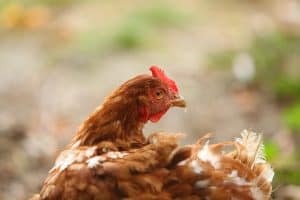 Molting chickens may be a huge surprise for first time chicken owners. I know that it was for us. One day we went out to check on the girls and there were feathers EVERYWHERE! What the heck?! I mean, it seriously looked like a huge pillow fight had happened overnight. None of the chickens seemed to be hurt, injured or missing. But we wondered what would cause this? Were they sick? 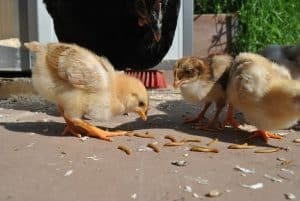 If you own backyard chickens, you should definitely learn about molting chickens so that you know what to expect and how to help them through molt. 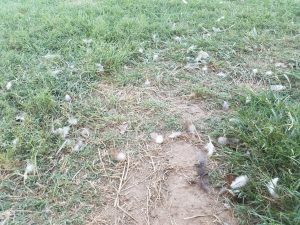 If you have a chicken losing feathers all over, it is likely that you have molting chickens. Luckily, molting chickens is a very normal, annual occurrence. What does molting mean and What is molting? So, what does molting mean? Molting, by definition, is loosing and then replacing feathers, skin, shells etc. (source). In chickens, the answer to what is molting, is (very simply put) the loss and replacement of their feathers. This loss of feathers usually starts at the head and progresses down their body to their tail. They then start gradually growing in new feathers to replace the old ones. Molting chickens will usually have a significant decrease in egg production – often times they actually stop laying all together. This is due to the fact that producing new feathers is a high energy and protein demand on the chickens body. Thus taking away their ability to put energy into making/laying eggs. Looking at the answer to what is molting, you may wonder, does that mean other animals also molt? The answer is yes! For example, ducks also molt. Molting puts a lot of stress on the chickens – it take a lot of energy and protein to make all those new feathers. 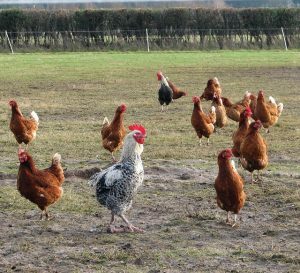 So, feeding plenty high protein, high quality food will help your chickens produce those feathers more easily. 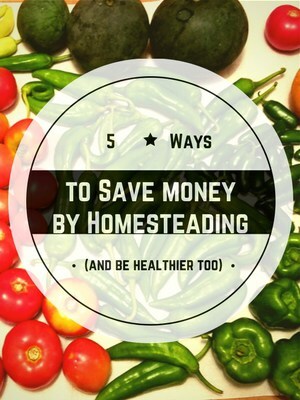 Also, try to cut out any filler type foods like regular scratch. Try giving high protein snacks as well like mealworms. In addition to food intake, try to reduce overall stress. Don’t introduce new chickens to your flock while molting. Also, try not to handle the chickens too much – those new feathers growing in can be sore and can actually bleed pretty easily. Now that you know the answer to what is molting, you may also wonder: when do chickens molt? Chickens typically molt in the Fall. When daylight hours start to shorten, you will usually see molt start. Not all molting chickens will follow the exact same timeframe. So, you may see some start sooner or later than others. But, in general, they will complete their molt in Fall time. Simply put, chickens molt to renew their feathers. You can even see a mini-molt in young chicks about 1 – 2 months old as they blow their chick fluff and grow in their adult feathers. 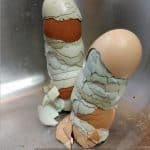 How long do chickens molt? Wondering about the question how long do chickens molt? The answer to this is a bit of a range. Different chickens will take a little longer than others to complete their molt. However, in general, molting chickens usually take about two or so months. Some chickens loose a ton of feathers and take quite a while to grow them back in and those chickens can molt for upwards of four months. As mentioned above, chicks will actually molt a few times before they are adults. They molt to blow their chick fluff and then again at a few months old to get their adult feathers in. After chick molts, how often do chickens molt? Typically chickens molt once (sometimes twice) a year. 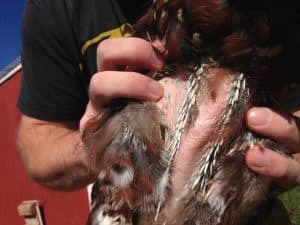 So, is molting chickens the only reason for a chicken losing feathers? No, it is not! 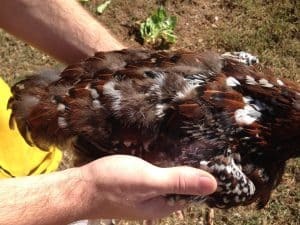 So, if you have a chicken losing feathers and it doesn’t seem like a typical molt, you may want to look a little closer. 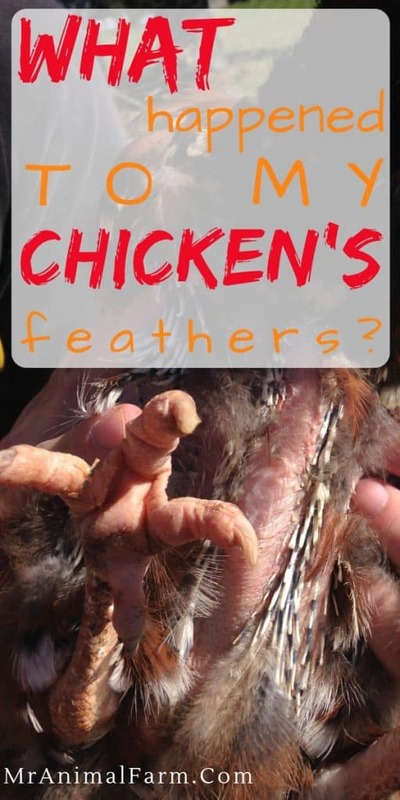 Chicken mites and chicken lice can cause a chicken to lose it’s feathers. Also, if a chicken is low in the pecking order and is getting picked on a lot, it can cause patches of feathers to be lost.